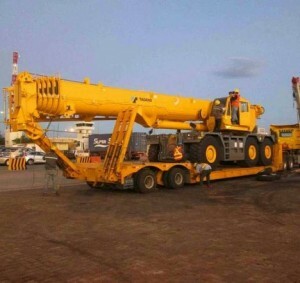 Phillipines based crane and access rental company Ravago Equipment Rentals has taken delivery of a new three axle 145 tonne Tadano GR-1450EX Rough Terrain crane. The new crane boasts a 61 metre six section boom with a 10.3 to 18 metre bi-fold swingaway jib, 16.1 metres long and 3.3 metres wide, it weighs 91 tonnes fully rigged and can travel at 15kph. Ravago is one of the largest crane rental companies in the Philippines, with a fleet of All Terrain truck and Rough Terrains up to 700 tonnes, it also offers a wide range of aerial work platforms, telehandlers and general equipment.